AirAsia's Red Hot Sale is Back, Promo Tickets for 2018 Up for Grabs! 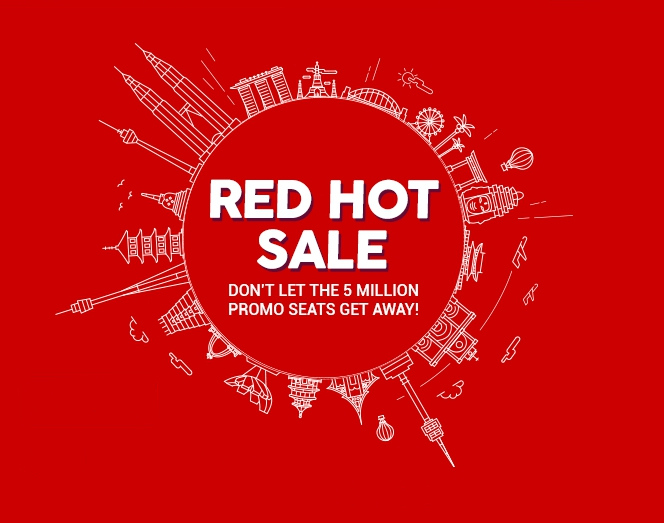 Air Asia announces another edition of their popular Red Hot Promo offering up to 5 Million promo seats. The promo runs from September 11 to 17, 2017 and offers discounted flights from March 1 to November 21, 2018. The discount is available on both domestic (Philippines) and international flights. Air Asia operates in four Philippine hubs, Clark, Manila, Cebu and Davao where it flies domestically to other destinations such as Puerto Princesa, Tagbilaran, Kalibo, Boracay (Caticlan), Tacloban and Iloilo. It also flies direct to international destinations such as South Korea (Incheon), Malaysia (Kuala Lumpur and Kota Kinabalu), China (Hong Kong, Guangzhou, Shanghai and Macau) and Singapore. To avail of the promo, just go to their website www.airasia.com and book your tickets. Air Asia is the biggest low-cost airline in the world and a pioneer in the cheap no-frills flight business model.